Motor racing fans can get the fast track into HondaF1 downloadable ringtones, wallpapers, screensavers and other phone content with the launch of a new mobile internet site. The Honda site can be accessed easily by texting the word HONDA to the short code 63330. The link received back takes users in to the Honda F1 Wap site that delivers updated information and free downloadable content from the Honda F1 Team. Images of Honda F1 Team drivers Rubens Barrichello and Jenson Button will be available, and there's a selection of well roaring engine downloads as ringtones. Wallpaper mages will be regularly updated as the Formula 1 Grand Prix season progresses. Users of the Honda site will also be able to browse some of Honda's car range on their hone, order a brochure, book test drives (though not of F1 cars), find their nearest Honda dealer, and request call backs. 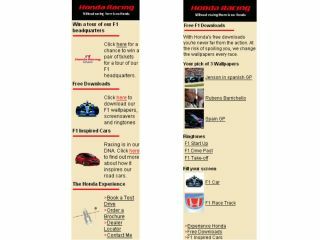 The site will also offer a competition to win a tour of the Honda F1 headquarters.